to provide meaningful communities for students, and enhance the student experience for both residential and commuter students by providing an environment in which students have access to faculty and staff who can assist them with problems and provide academic and personal guidance. to provide a locus for interdisciplinary interaction amongst faculty in support of their teaching and research. Colleges provide a home away from home for students and faculty members. They are friendly, stimulating and lively communities with physical features that provide a sense of place. A successful career anda well-lived life are more likely to be achieved by individuals with a broad range of knowledge and experience, and the Colleges provide a setting for unparalleled intellectual and social adventure. Only three universities in Canada have a college system in which all undergraduate students belong to a college. Thus, the college system is one of the unique features of York University that underpins its interdisciplinary and innovative nature. The tradition of having colleges as an integral part of the fabric of the university began in England centuries ago, and the college system has proven to be an essential part of universities on several continents that are community-spirited and that have an interdisciplinary focus. In addition to students, York’s Colleges include faculty members, staff, and distinguished members of the outside community who represent a broad range of academic disciplines and who are dedicated to promoting excellence in education, to extending the bounds of knowledge through interdisciplinary exploration, and to the “fellowship” of the college community. York University’s Colleges are unique in that each has a distinct theme and history. York University’s Colleges combine tradition with innovation. They retain the centuries-old term for the head of the college (the “Master,” or faculty member with a proven record of service to students) and for college faculty, staff, and community affiliates (“fellows,” or persons committed to collegiality, interdisciplinarity, and student support). They have abandoned the traditional references to “college tutor” and “residence tutor,” and replaced them with “Academic Life Coordinator” and “Residence Life Coordinator.” As well, the York University colleges have academic mandates that are much more focused than those at any other university we know of. Ninety per cent or more of the students in each college are commuter students, and the colleges provide a home for them — as well as the college residence students — during their university years. 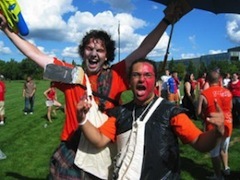 One or more of the student clubs and activities in each college are bound to appeal to students, and events are scheduled with commuter students in mind. The colleges at York collaborate with the Division of Students, the Faculties, departments, and student organizations to provide services to students, including orientation for first-year students, academic advising, co-curricular activities for Foundations courses and program introductory courses, college student governments, academic and recreational student clubs, intra-mural sports, and musical and artistic activities. Furthermore, they provide career days, assist with the organization of convocation, promote and support alumni associations, and engage in community outreach services (such as programs for low-income elementary students, and a city-wide anti-bullying program). Each of the colleges has a distinctive theme, and each is affiliated with specific academic programs and is responsible for providing services to students and faculty in these programs. Each college has 100 or more fellows who have been invited to join the college because they are committed to supporting students and to promoting the interdisciplinary nature of the university. In addition to the colleges listed above, there is a ninth college which also operates as a complete faculty: Glendon College. Glendon College is a separate full-service, bilingual, liberal arts campus located near Lawrence Avenue and Bayview.